Day 7 (September 14, 2012) Rotorua and Tongariro N.P. This day is the one with more kilometers to cover. In this route from the North of the island to the South we probably will stop for lunching in Taupo. In our way that morning we pass through beautiful volcanic areas, different than anything we’ve seen before. The candidates to be visited are: Waimangu, Wai O Tapu and Craters of the Moon. The main visit, and likely the first, would be Wai O Tapu. There is a geiser in there, called Lady Know, which is activated with soup every morning at 10:30h. Afternoon would be dedicated to Tongariro National Park, where we will be able to enjoying the view of the three volcanoes there. Tongariro is the one gives its name to the park, but Ngauruhoe is the one used in “Lord of the rings” trilogy as Mount Doom, where the ring should be destroyed. We will stop there to watch the landscapes which will recall Mordor ones. Then we ideally would drive to Eketahuna, where there is a cheap and – based on the reviews – fantastic Holyday Park close to the first visit of the next day. If we reach it we will win a valuable time for the next day. If we complete this itinerary we will cover 450 Km, which will take around 6 hours approximately. As the sun rises we are there for shower and breakfast. My bizarre sleep, which still makes me waking up around 4 AM, allows me to write another page for this web site. Today is the day we must drive more time in the whole travel, but it will be basically at afternoon. Now we are going to see this city and visit the geothermal areas around. First step then is going to the museum, a beautiful building, and using the nearby i-site to get the ferry tickets. We drive to there but, as parking three motorhomes is not easy, we get into the “Countdown” supermarket car park. That makes things easier, as we all needed to get some goodies. I go to i-site and the rest will perform their shopping. I find the i-site just in the clock tower building, a little further than I thought, after around four long blocks of shops closed some minutes past 8 AM. Somehow, when I’m coming back with the tickets around 9 AM, shops are opened and there are several for souvenirs with good prices. 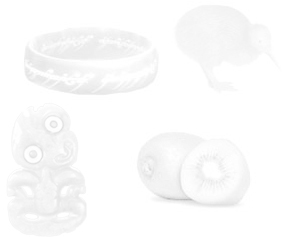 I get into one and do a quick purchase of stuffed kiwis. I go into the supermarket, as the group is still there, and explain about the souvenirs shops as I know they want their gifts too. We then decide to forget about geyser at 10:15h to be able of do some shopping finally in this travel. This city stinks, literally, but we’re getting used to the peculiar smell of rotten eggs of this whole area, which we already noticed yesterday and it is still here. With this, we leave Rotorua around noon and, in 15 minutes, we’re in Wai O Tapu, the main geothermal attraction. We do the whole itinerary in Wai O Tapu, walking through craters with the known smell, only it is stronger as per, in some moments, needing to use our hand to close nose and mouth. This is essential when reaching Champagne Pool, the beautiful bubbled pool green with orange borders, which gives a dense smoke off practically unbreathable. But it is big and wonderful and the most steaming place in the whole Wai O Tapu. There is a wooden platform to go across it to follow the path. Apart of this highlight, the area is full of pools with impossible colors depending of the minerals coming from the deepest part of the earth. There are endless and colorful craters as the one in the picture labeled as "Devil's Home" but, being there, I really thing is just the toilet. Vegetation is affected too and shows parts in brown or orange making part of the path a creepy look, as for a fairy tale forest. This is unique in the world and you feel like it is. We leave the place amazed, but wishing to get this smell off of our clothes, and we drive directly to Taupo Lake with just a single stop in the way in Huka Falls, a spectacular falls because of their volume of flow more than the height, which make them strong and noisy. Once in Taupo, we use the “Countdown” car park twice today, but with so little space this time. Taupo is the largest lake in New Zealand and names the city in its shore which we are. It’s a kind of town with a lot of live but, as we’re passing along a lot of restaurants, they’re mostly closed and, the ones which are not are closing now, at 15:30h. We finally manage to lunch shawarmas in a small Turkish place with just a few chairs outside. The restaurants are mainly Japanese or Thais around here. With a full stomach we can go on with our drive. Next stop is a National Park with three volcanoes on it. One of them was used on “Lord of the rings” trilogy as Mount Doom and, therefore, all its surrounding area has been renamed as “Mordor”, as those are the landscapes of that fictional… I don’t know… country? Here is the sun which marks the end time for our visit and, although we could see - or sense - the volcanoes from the road since time ago, we take the long gravel road at dusk. On this drive, we can feel the loneliness of the place, in a path in the middle of the vast flats surface full of small and brown vegetation, with the shape of the base of the hidden mountain in front, completely white. We end in a parking area which seems to be in improvements. There is absolutely nobody here and we can find toilettes, water and the start of the Tongariro track. Snow is close to us, but it is not that cold as we could expect. It’s a pity we cannot enjoy the full view of Ruapehu. 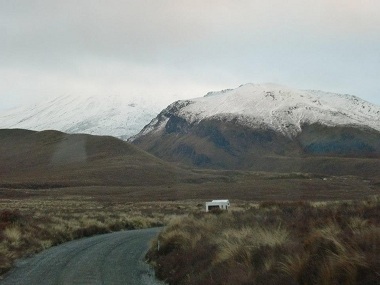 We leave the place on time of getting the road before dark, we must miss then the road to Whakapapa and driving as far as possible. If we manage to reach Erekahuna today, we’ve practically crossed Northern Island vertically in one day. And we do it. Around 23:00h we arrive to the lonely and dark Holyday Park, after five hours driving from Tongariro and fighting against the sleep on the last ones. Now, we only have to plug our motorhomes and rest.